This is the first version non-beta to be digitally signed with a certificate. Hopefully, it will reduce the number of false positives that are generated by anti-virus software. You will at least be guaranteed that no one has tampered with the install file. This version is the first one non-beta published on the Sailwave site to be built with a new version of the compiler and this enables touch control to scroll the data around. So if you have a touch-enabled device give it a go. 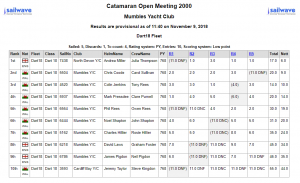 RORC high point scoring is in Beta in this version. The RORC factors are not implemented for RORC series as yet. This Version also has Iceboat support in Beta. The install also contains updated versions of SWCList, ISAF (World Sailing) interface and the SWHelper for NHC scoring which now supports internal calculations when you are using PY numbers. You will also notice some cosmetic and font changes. There are improvements in the RYA PY returns and some bug fixes. New Rating files are included as are the additional information for the PY returns. This update is supplied as a full install containing the Sailwave.exe version 2.28.1. You need to download from the link below and run the installer. If you have any issues installing please try running the installer as administrator by right-clicking the sw2_28_1.exe file and selecting run as administrator. Huw has tested the installer under Linux without any problems but points out if you are using Wine you should be using at least version 3.0. 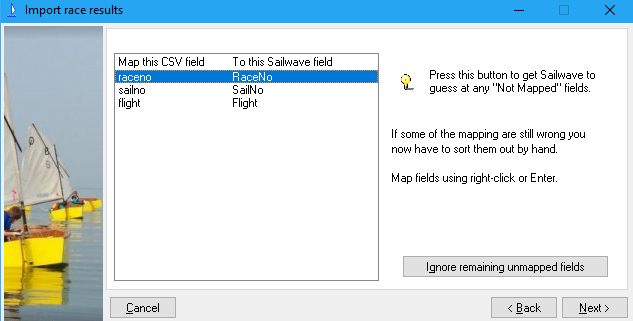 If you want to run the World Sailing (ISAF) interface with Wine or on a Mac please ask for help or see instructions on the Sailwave User Group. This is the first version to be digitally signed with a certificate. Hopefully, it will reduce the number of false positives that are generated by anti-virus software. You will at least be guaranteed that no one has tampered with the install file. This version is the first one published on the Sailwave site to be built with a new version of the compiler and this enables touch control to scroll the data around. So if you have a touch-enabled device give it a go. This Version also has Ice boat support in Beta. This update is supplied as a full install containing the Sailwave.exe version 2.28.0. You need to download from the link below and run the installer. If you have any issues installing please try running the installer as administrator by right-clicking the sw2_28_0.exe file and selecting run as administrator. UPDATE 4th March 2019 – Due to some missing PY’s in the limited data file the RYA have reissued it and the changes have now been reflected in the Sailwave rating files available for download. If you have already downloaded them please update with the current version. The new 2019 Portsmouth Numbers released today by the RYA are available for download from the rating file library of the Sailwave website. There is also a limited data file of ratings for classes which have not received enough feedback to be included in this years updated ratings. You can load multiple files with Sailwave if you place them in your ratings directory. You can examine and edit these file with a text editor or compatible spreadsheet. We understand your Heart Internet services are important to you and we are very sorry any potential downtime comes at such short notice. We have not taken this decision lightly and have decided to take immediate action so we can make the fix and maintain the quality of our service. We really appreciate you’re understanding and we will notify this page as well as social media as soon as the works has been completed. 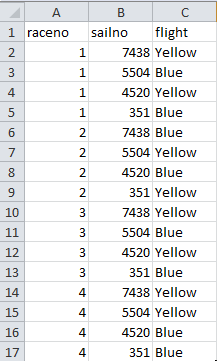 This effect highlights discards in the series summary tables. The default colour is a light grey but the user can change the colour as required by editing the source. This new version fixes a bug with discards of medal races that was introduced in 2.25.9 So it’s important if you are scoring with medal races. This update is supplied as a full install containing the Sailwave.exe version 2.25.11. You need to download from the link below and run the installer. If you have any issues installing please try running the installer as administrator by right-clicking the sw2_25_11.exe file and selecting run as administrator. This new version fixes a bug with publishing unsailed races even when all races are selected. So it probably won’t affect many users. This update is supplied as a full install containing the Sailwave.exe version 2.25.10. You need to download from the link below and run the installer. If you have any issues installing please try running the installer as administrator by right-clicking the sw2_25_10.exe file and selecting run as administrator. New Version includes some new features and enhancements and a bug fix for the finals discard profiles when performing Qualifiers and Finals. This update is supplied as a full install containing the Sailwave.exe version 2.25.9. You need to download from the link below and run the installer. If you have any issues installing please try running the installer as administrator by right-clicking the sw2_25_9.exe file and selecting run as administrator. 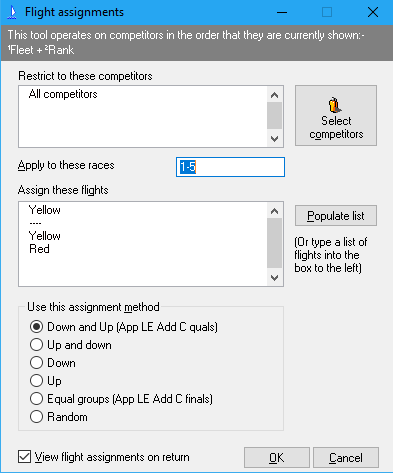 When publishing individual races with the option of sailed races only the races with results will be published. Publishing using Results V2 will auto size the header images and improve the balance of the results appearance. More details on the Sailwave User Group. Flights are stored for each competitor and each race. 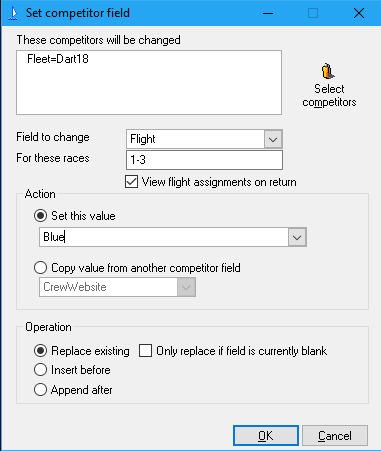 There is also a Flights field which belongs to the competitor which is their current flight. Tooltips are available to assist you.